Cuban anti-terrorist fighter Antonio Guerrero called for the continuation of the struggle for peace and love in order to wipe out hatred from the world. 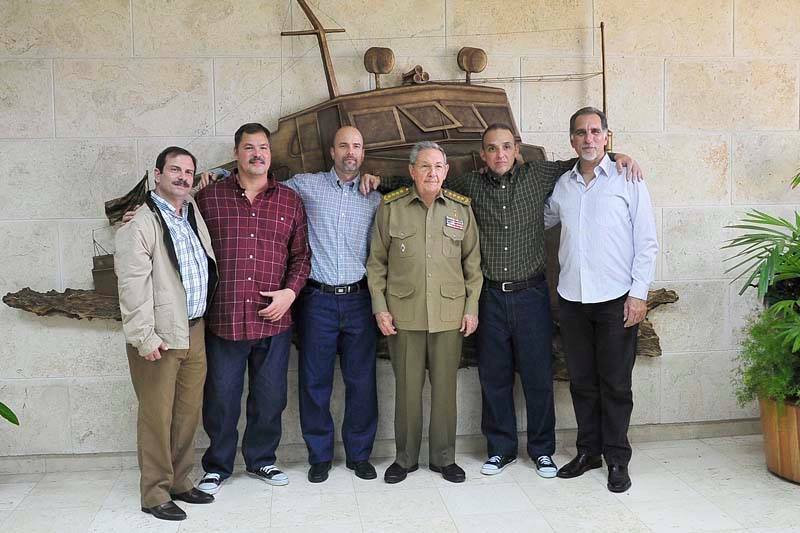 The five Cuban anti-terrorism fighters who finally returned to Cuba met with Cuban President Raul Castro on Saturday. Kenia Serrano, president of the Cuban Institute of Friendship with the Peoples, after hearing the news of the return of Gerardo Hernández, Ramón Labañino and Antonio Guerrero, three of the five Cuban heroes, first thought of the historical leader of the Cuban Revolution, Fidel Castro. Activists with the Miami-based Martiana Alliance Coalition close their 2014 agenda with a meeting on Sunday, December 14 to demand the release of Gerardo Hernandez, Ramón Labañino and Antonio Guerrero, three of the five Cuban anti-terrorist fighters, who are still held in US prisons. Books, postcards and posters on Cuba and the Cuban Five convicted in the United States for denouncing terrorist actions against their country stood out among the varied offer of the 58th Beirut International Arab Book Fair 2014. The Cuban Five were not arrested for having committed any crime, but for being followers of a revolutionary process that has defended the dignity of our people, said Fernando Gonzalez, one of the five Cuban antiterrorist fighters who were unfairly imprisoned in the United States in 1998. The Reverend John McCullough, president and executive director of the Church World Service U.S.A. paid a pastoral visit to Cuban antiterrorist fighter Antonio Guerrero at Florida´s Mariana penitentiary, where he is being unfairly held. The official Web site of the Church World Service (CWS, http://www.cwsglobal.org), a religious institution with humanitarian purposes based in New York, U.S.A., issued on Thursday a press release on the visit paid by CWS President and CEO Reverend John L. McCullough to the Hero of the Republic of Cuba Antonio Guerrero in the federal prison of Marianna, Florida, where he's serving an unfair sentence for fighting terrorism. A recent forum held in Lincoln, Nebraska, in which over 100 participants addressed Washington´s wars on Iraq and Syria and environmental issues, had the case of the Cuban anti-terrorist fighters held in US jails at the center of discussions of the Nebraskans For Peace event.